This is my eighth winter in Mexico and I can’t recall ever having such dreary weather. Clouds have permeated the skies all month, what the weather forecasters here term as “intermittent clouds.” My heart goes out to the tourists who have come for only a week or two. It has also been unusually cold in the evenings. I can’t remember the last time I walked along the malecon at night without a sweatshirt. And some of those ocean breezes are quite strong as well. What do you do in Mazatlan when the weather is so grim? There is a lot to do here aside from indulging in tequila or cerveza at the local cantina. It’s true that there are restaurants and bars in abundance. But February has been the perfect month to immerse oneself in the Mexican culture. One of my favorite places here in Centro is the Plazuela Machado. While the days are relatively quiet aside from cruise ship days, the nights come alive with a flurry of activity. Music resonates from the numerous restaurants in the square. There are often musicians and dancers performing in the square itself. Vendors have their stalls resplendent with jewelry, clothing and souvenirs. Traffic is quite congested as pulmonias and taxis clog the narrow streets. And holidays find colorful displays of lights and festive decorations. Teatro Angela Peralta is conveniently located just off the square. The variety of entertainment here is absolutely amazing. Sunday afternoons feature classical music. I attended a concert of Handel’s water music and the renowned Winnipeg Symphony Orchestra pales in comparison to this performance. On Friday night I attended Los Diez Pianos and was totally enchanted with the music and the vocalists. Another favorite venue is El Recreo. I’ve gone to movies and jazz jam sessions here. There are a variety of other activities such as travelogues, fashion shows, yoga, Spanish classes and other musical events that are held here. Also popular is a book swap. The snowbirds all flock to El Recreo during the winter. Museo de Arte is home to numerous musical and dance performances. Many are free or charge a nominal admission fee. I even attended a play there where the dialogue was entirely in Spanish. Tonight I’ll be going to a guitar festival. Of course February began with a bang with the celebration of Carnaval. Over half a million people lined the streets to attend the main parade. I also went to the second parade and it too was crowded. The fireworks were awesome and the music was excellent, highlighted by a performance by BandaMS. There were other events held at various places as well. Busloads of tourists came to Mazatlan for this popular festival. I did escape to sunshine and soaring temperatures one weekend when I went to Culiacan to spend time with my family. It’s interesting how you go a few miles inland and north and the humidity drops and the heat rises. We spent quite a few hours outdoors as we were at an event at my grandson’s school, the same school where I taught when I first came to Mexico. In this photo my grandson is sporting his medal. I belong to a Red Hat group and we get together for lunch twice a month. We all wear purple and red clothing and jewelry. We even accessorize our purses and wallets in these colors. We go to different restaurants and always have our photo taken. I also belong to the Mazatlan Solo Snowbird group. In addition to the monthly meet and greet, this past week we went on a day trip to El Quelite. This charming town is one of the magic towns in Mexico and we are transported back in time to a place where the natural beauty has been preserved and there is not an Oxxo in sight. I also volunteer in a kitchen at a Christian mission in my neighborhood. At the moment there are approximately 150 young adults from countries all over the world. Some live at the mission and study there. Others come and go for days or weeks. The program offered provides a wonderful opportunity for people to experience life in another culture. I still play Hand and Foot with my friends out in Sabalo Country. I had never heard of this game until I arrived in Mazatlan almost three years ago. Until then I had only been an ardent bridge player up north, especially in Leavenworth. One of my neighbor’s has a catering company. In addition to buying delicious prepared food from her, I enjoy her weekly luncheons. In the past there had been a mixed market, but it has evolved more into a social gathering place and a book swap. If there were more hours in a day, I could be playing bridge and cribbage. I could be attending numerous fundraisers and musical events. I could be spending hours on the beach daily instead of the mere one day at Stone Island earlier this month. I could be doing more exploring on my own although I did get to Villa Union a couple of weeks ago. I could go more often to the air-conditioned malls. However I am determined to focus more on my writing. When I am at home, I am working on my book or on a blog post, except for the courses I take on the internet through coursera. I just completed a course from Stanford on nutrition and this week I start a course on relationships from University of Toronto. The weather this month may have been dreary, but my life certainly is far from dreary. In another lifetime when my children were young, Valentine’s Day meant decorating the house, baking cookies and a special cake. But they are grown now and we live in different countries so I celebrate this holiday a little differently. I spend the day with friends rather than with family. Of course last year was quite memorable as I was in Guadalajara having cataract surgery. Off I went to the bus station to buy a ticket to go to Culiacan on Saturday. This weekend there is an event at my nieto’s school, the same school where I taught my first year in Mexico. After I purchased my ticket, I then boarded a bus for Villa Union. Thankfully it was air-conditioned, as the temperatures here have soared recently. 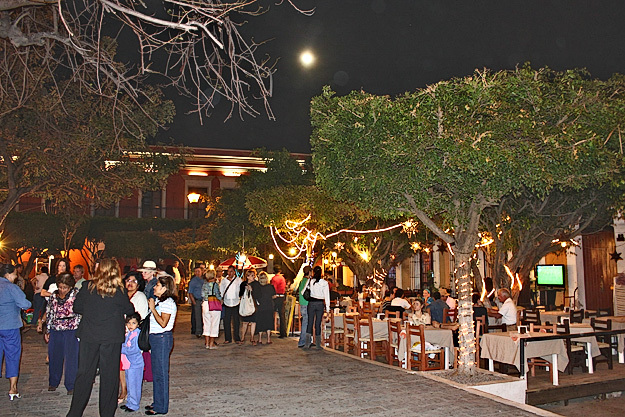 Villa Union is a small town quite close to Mazatlan with a population of about 13,000. It is quaint, although it does have a Panama and a Coppell. El Cuchupetas is also a popular seafood restaurant that attracts people from Mazatlan. The church was what intrigued me. I have visited and photographed several churches in Jalisco and Sinaloa. Parroquia San Juan Bautista is easily visible from the highway that goes straight through the town. I have passed by it before but this is the first chance I’ve had to actually go inside. Seeing as it was Valentine’s Day when I visited Villa Union, the streets were lined with colorful displays of stuffed animals and helium balloons. It reminded me of when I lived in Tlaquepaque and the square was filled with similar displays. For lunch I opted to eat where the locals go. I checked out a few street stands before I chose a small family type restaurant that had only six tables. I enjoyed delicious enchiladas, rice and beans and had a view of the mercado and the activity on the street. I wandered around the town capturing photos and talking to some of the locals. It was an excellent opportunity to practice speaking Spanish as I did not hear one word of English the whole time I was there. Here are a few shots taken around the town. All too soon it was time to return to Mazatlan for the jazz jam at El Recreo. It was a most enjoyable Valentine’s Day. I hope yours was too.